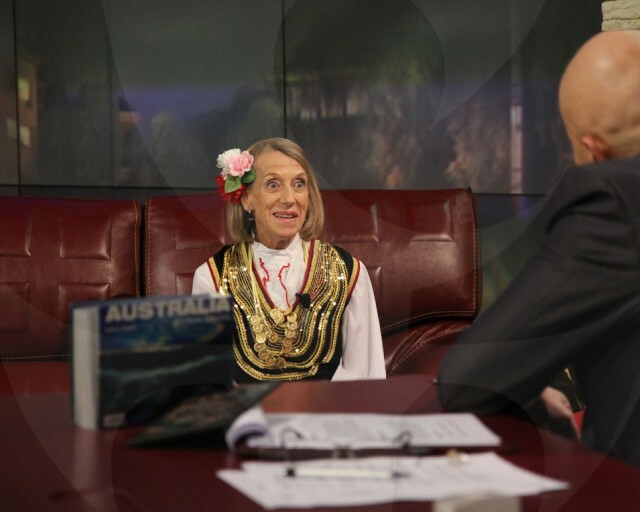 Australian Anna Travali who has lived in Sofia near Iztok neighborhood since 10 years was a guest on “Slavi’s Show”. Wearing a national costume from the Shoppian region Anna presented an interesting performance of Petrunino dance – which was applauded for a long time by the audience in the studio. That same love of Bulgarian music and dance brought Anna, who is originally from Sydney, to Sofia. She first came to a Balkanfolk seminar for two weeks in 2001 but a year later was invited to join ensemble “Zornitsa”. “Everything here is very beautiful – the Black Sea, Rhodopi mountains, Pirin, folklore … I also have a very big family in ensemble “Zornitsa”. Bulgarians are very good and true friends. It’s wonderful, otherwise I would not still be here.” According to Anna – there is a special ambiance in Sofia and Bulgaria, a certain feeling. “I fell in love with Bulgaria – the people, dancing, music …” she said. After she lived 12 years with her husband on a boat by the Great Barrier Reef and fishing was their only way of making a living, Anna came to live in Europe – she spent several years in England, Norway and Italy. Over the last 10 years she never thinks of leaving Bulgaria and her friends from ensemble “Zornitsa”. She was even named as the talisman of the ensemble and tours with it in France, Poland, Greece, Egypt, Turkey, Albania and other countries. “You are too critical of yourself. You should be more optimistic and have higher value of yourselves because you are worth it. There are fabulous people in Bulgaria,” concluded Anna Travali.